April showers bring pretty cards … at least that’s how the phrase goes to me. 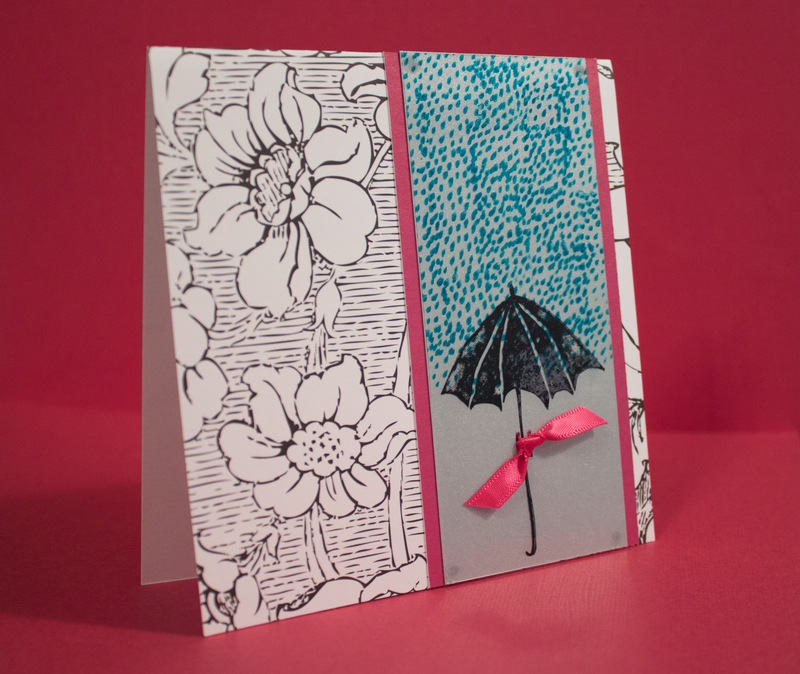 A rainy day inspired me to make this card and to show how to stamp on a transparency. As I mentioned last week, the key ingredient is StazOn ink. This ink is permanent and usable on many surfaces, such as metal and glass. It can be found in most craft stores. If you use StazOn, purchase the StazOn stamp-cleaning fluid. Otherwise, the ink will not come off your stamps. To stamp on a transparency, ink your stamp with StazOn. If the transparency is for ink-jet printing, the transparency will have a gritty coating on one side. Stamp your image on that side. After stamping, let it dry. To attach the transparency to cardstock, I recommend using a glue that dries clear, such as Aleene’s Jewel-It. Apply small dots of glue to the transparency’s corners. I also used a ribbon punch on this card, which is a must for any paper crafter. It has its limitations in terms of how far it can reach, but it makes threading ribbons a piece of cake (mmmm … cake). This entry was posted in Uncategorized and tagged Spring, transparency. Bookmark the permalink.